Presidential" performance for the ultralight enthusiast! Incredibly smooth, crisp handling in a tiny package for maximum fun with light line. Quality 8-bearing system with instant anti-reverse; aluminum spool; Sure-Click Bail prevents premature bail trip; titanium-coated spool lip and line roller machined-aluminum handle. FREE aluminum spare spool and storage bag. "well according to my name, you can probably tell that im a big ultra lite fishermen, and this reel is definitly up there wuth my favorites, i fish it with 4 pound line and a light bps graphite series rod, nice combo"
"This is by far the best mini reel I have put my hands on. The drag was there for me when I hooked up on a 4lbs trout." "The Pflueger President Micro Ultralight Spinning Reel is a high quality piece of fishing equipment. Consistent casting and ultra smooth reeling makes using this reel a pleasure." "Good reel. I bought this for panfish and it works great. 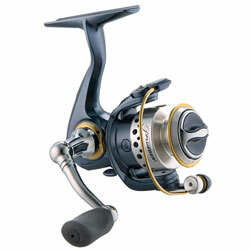 It casts nice and is a sturdy little reel."